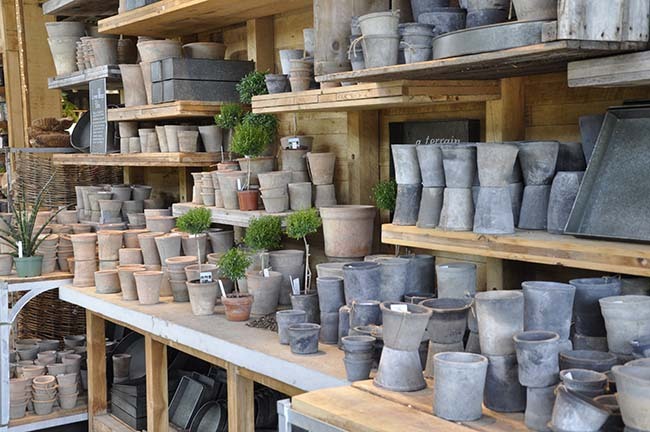 A couple of weeks ago we stopped in at the Westport location of Terrain (URBN, of Urban Outfitters and Anthropoloie's retail and mail order store for plant lovers and gardeners), here are a few photos to spark ideas and to inspire you this early, July day. So hard to choose, but if you could only choose one gift item, what would it be? I hate this about Terrain! Jess waits for me to catch up - at this amazing retail store which once was an auto dealer. For many more images of our visit, click below. 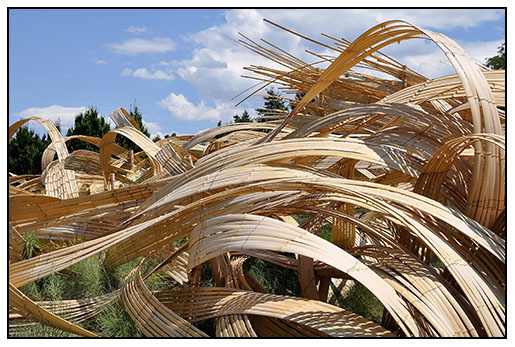 Kizuna-West Meets East, is the current exhibition at the Denver Botanic Gardens, featuring two installation artists who work in bamboo, yet in very different ways. This work, by Tetsunori Kawana is one of many which undulate and flow through the open spaces at the Gardens. 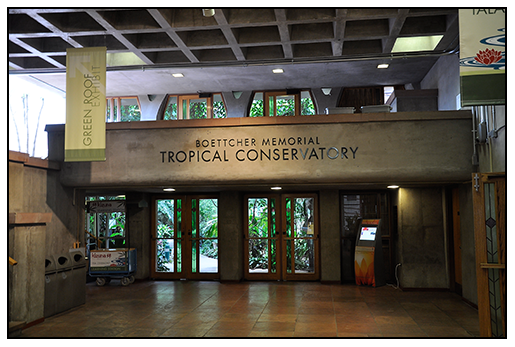 Check out my post from two years about his work at the NYBG. All museums today struggle with attracting and retaining an audience, with fierce competition for time, money and repeat visits, cultural institutions sometimes lean on other ways raise money ( mainly tacky gift shop sales of garden flags with sunflowers on them, or tote bags and umbrellas). Not the Denver Botanic Gardens (DBG). They attract people like honey bees on an Agastache. In our world of budget cuts and multiple distractions ranging from TV, sports and back-to-school sales, the DBG is busier than ever. I don't know what the Denver Botanic Gardens has discovered about doing business, but from what I could tell, they are the brightest shining star on the horizon, and they should be the standard which any botanic garden today measures itself against. They appeal, attract and seem to retain an ever increasing membership - a membership who is not only engaged with events and attractions, they are also engaged with gardening and plant - Holy cow, what the heck happened in Colorady? Hopefully, they will share their secrets with the rest of the gardening world! There is something very human about the DBG. Long walks, attractive plantings that are interesting, and many events - enough to attract a crowd even on a 96 degree hot August weekday. 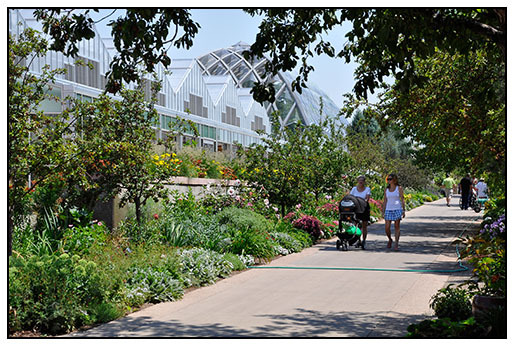 Be sure to 'Like" the Denver Botanic Garden on Facbook, they would like that. I visited the Gardens four different times this week. In the morning, strollers and moms, often with friends, took advantage of the cool mornings to both look at the many attractive and stylish plantings, and I over-heard many talking about their own garden plants. At lunch on day, while taking photos in the famous rock garden, I watched a couple discuss their plans on how they were just about to tear out their lawn, and plant a xeric garden- they were making lists on how many plants they needed of each species. On Thursday evening, just as the sun was setting over the Rockies in the distance, two older women discussed the benefits of various membership levels ( something about how two can get in for one-deal, even if they are not family). Clearly, this is an institution who is not only relevant and in-touch, they are growing, and it's easy to see why. 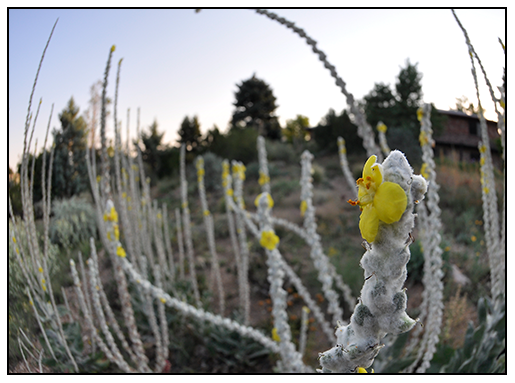 AN OPUNTIA AT SUNRISE, IN DENVER THE GARDEN OF PANAYOTI KELAIDIS, WHERE I AM STAYING AS A GUEST THIS WEEK. 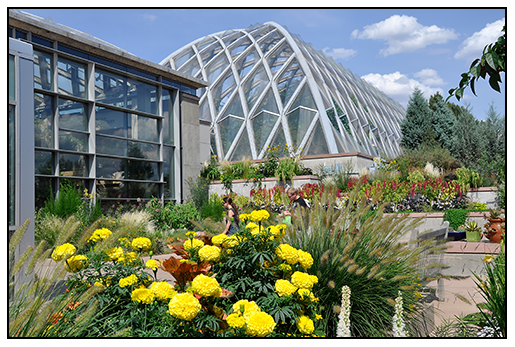 This week has been such a treat, first, as I have been invited to speak at a meeting of the Rocky Mountain Chapter of the North American Rock Garden Society held at the Denver Botanic Gardens. When one thinks of Denver, in the east, I think many of us imagine mountains and sky resorts, as most seem to fly in and rent a car, to rush up to Vail or Aspen, but the city of Denver in many ways offers more horticultural interest than one may at first believe. I realized this today, as I strolled around the well known rock garden of Panayoti Keladis, one of the plant world's most notable plantsmen. To many of you who know PK ( as his closest friends call him), you already are familiar with his hospitality, homer and sometimes even snarkyness, but all kidding aside, Mr. Kelaidis is an iconoclast of American horticulture, so being able to spend a few days under his wing, has been a pleasure. Did I mention that PK is also a tireless tour guide? 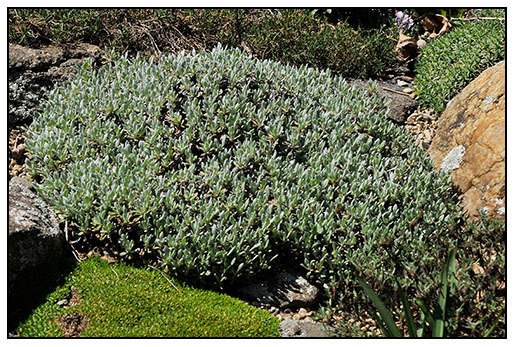 I will admit, that I was pre-warned by some friends that I may need to take some extra vitamins so that I could keep up with him for Panayoti appears tireless - especially while viewing other gardens, his favorite nurseries or when walking with him as he makes his rounds at his prestigious day job as Senior Curator and Director of Outreach for the Denver Botanic Gardens. Needless to day, I've seen much, and experienced a new world of gardening here in the beautiful city of Denver. I've also met Albuquerque landscape architect ( and blogger) David Cristiani who is spending a night here at Panyoti's home, so together we visited many gardens in the area, and shared many laughs, barbecue and a couple of beers. I was eager to see Panayoti's garden, as he, as influencer and plant collector, has changed the way many of us garden today. 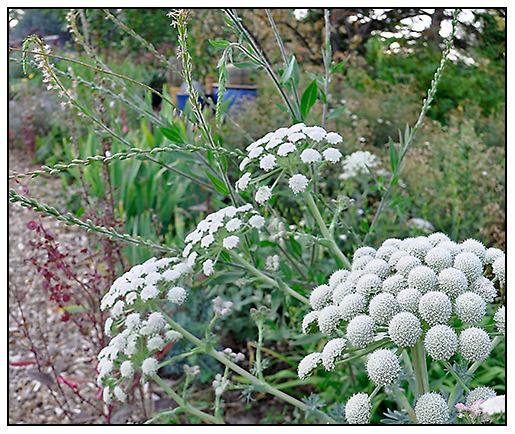 Since he kept me so busy, I could only see the garden in the early morning, or late evening, naturally, the finest time to photograph a dry plant garden. A FAVORITE OF MINE, WHICH I MUST GROW AGAIN, THE COTTONY WHITE STEMS OF Verbascum bombyciferum. THEY TOWER HIGH ABOVE MY HEAD AS I STROLL THROUGH THE GARDEN BEFORE BREAKFAST. 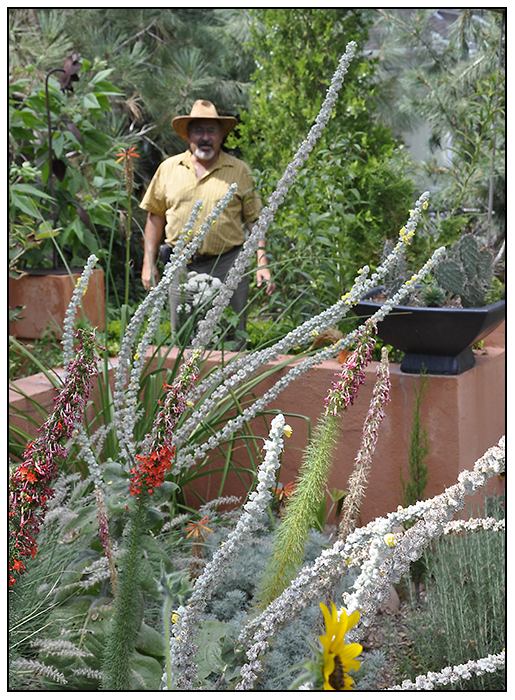 Panayoti has his hands in many plant related projects, from writing the forewords of many books, to being an active evaluator for PLANT SELECT, who develops and selects, as well as introduces many of the fine garden plants grown in xeric ( and non xeric) gardens today. Personally, this trip to Colorado has introduced me, face-to-face, with both the challenges and opportunities of xeric gardening. Something that I only hear about in the east. 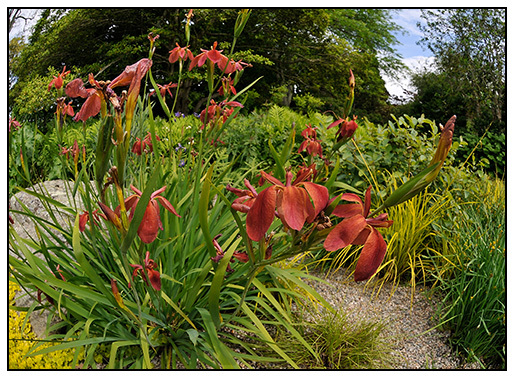 As a New Englander who keeps a garden that receives a luxurious 60 inches of rain a year - the idea of a xeric garden is about as foreign and a lawn of orchids. But anyone gardening today needs to be more mindful of water and resources, and deep inside my green head, a little voice keeps telling me that I may want to be more responsible. PANAYOTI WAS KIND ENOUGH TO ALLOW ME FULL ACCESS TO THIS AMAZING GARDEN AND FACILITY IN DENVER, A REAL GEM FOR THIS COMMUNITY, AND FOR THE GARDENING WORLD. I WILL HAVE MANY IMAGES TO SHARE WITH YOU OVER THE NEXT FEW DAYS. Fibigia clypeata, or Roman Shields is a member of the Mustard Family, but it's the seed pods that make this plant so valuable in the late summer garden. The Denver gardening community is far more knowledgeable and passionate about horticulture than I even imagined. 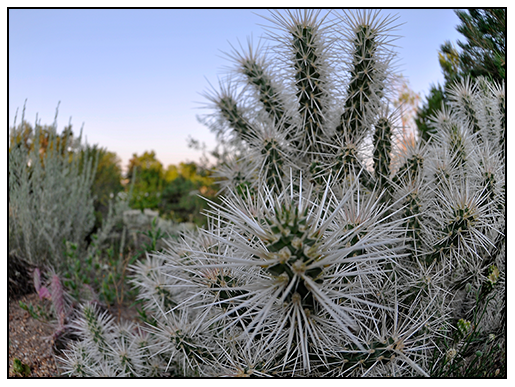 I think when I think of desert or xeric gardens, I imagine just succulents and native grasses, but once one introduces the rich diversity of native plants, the result is a more balanced and environmentally friendly gardens. I have never seen so many honey bees, hummingbirds and other little creatures in these Denver gardens, each one was unique and offered surprises at every turn. I was curious with the wide variety of plants being grown too, often together in the same garden. Peonies and cacti, Sagebrush and Lilacs, Succulents and begonias. I all depends on how much water each garden is willing to use, and I've learned that even a little water can go a long way. 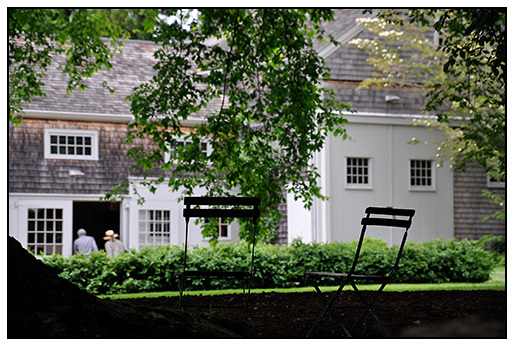 A PAIR OF VINTAGE FRENCH BISTRO CHAIRS INVITE GUESTS TO REST UNDER TOWERING AMERICAN ELMS AT THE HOME OF GIOIA BROWNE AND JIM MARSH IN LITTLE COMPTON, RHODE ISLAND. It's always a treat to see a mature landscape. You know the type - century old trees ( or even older), with massive trunks and deep, dark cool shade. 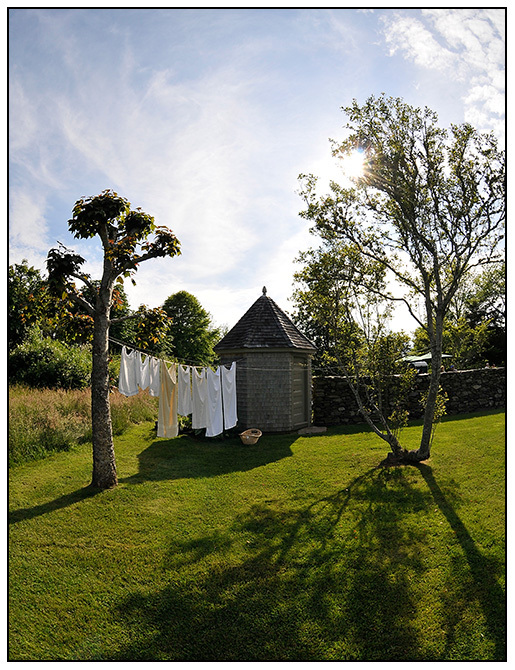 A nineteenth century barn, ancient stone walls, towering American Elms and elegantly long and breezy drives - such is the garden of our good friend Gioia Browne and Jim Marsh, located in the peaceful and understated New England town called Little Compton, in Rhode Island. 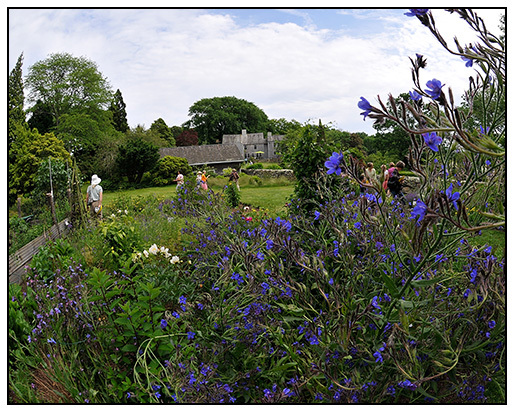 This was our second stop on this past weekends' Garden Conservancy Open Garden Days in Little Compton, which featured two amazing gardens, each offered a unique view into some of America's most special and important private gardens and homes. 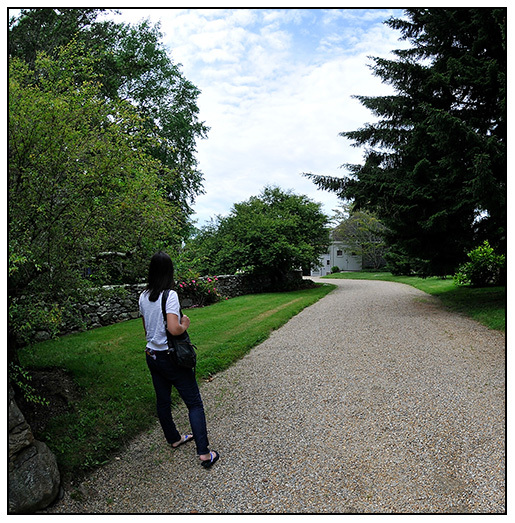 JESS ADMIRES GIOIA AND JIM'S GRAVEL DRIVE, PERFECTLY RAKED AND EDGED. WE IMAGINED THAT THEY HAVE DOZENS OF GARDENERS, AND NOT JUST ONE! 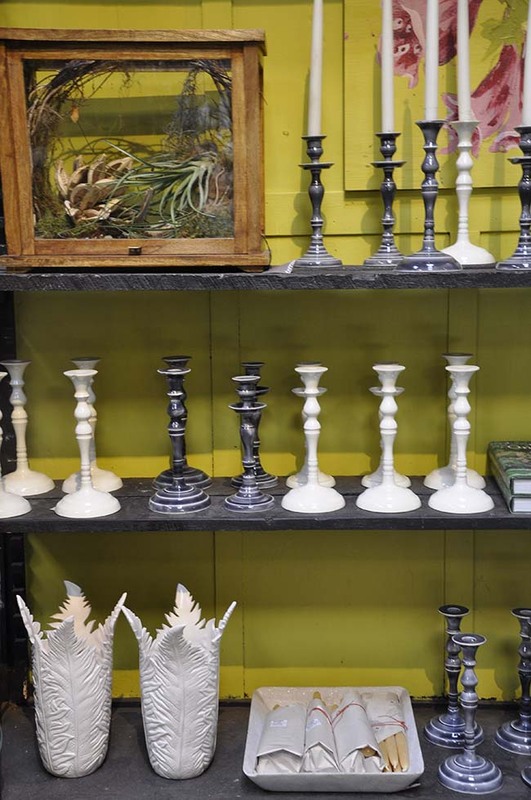 BOXWOOD PROVIDES STRUCTURE AND AN APPROPRIATELY PERIOD TOUCH ALONG WITH SOME ARCHITECTURAL CARDOONS. WE COULD SPY SEEDLING VERBENA BONARIENSIS EMERGING. 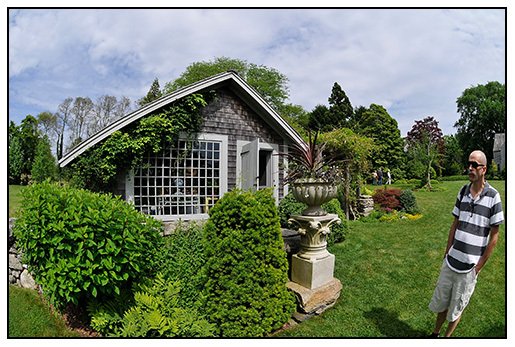 Gioia and Jim's garden is enchanting - the sort rarely seen anywhere today, classically New England with stone walls, shingle potting sheds and formal plantings, it also is a true plant collector's garden with treasures tucked away in every nook. 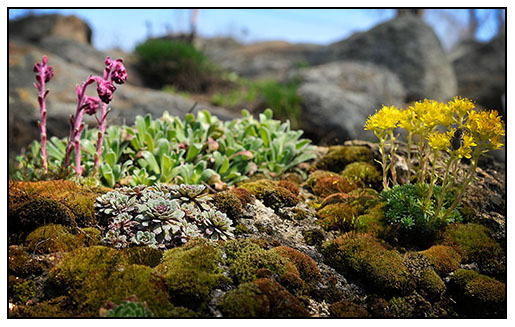 Sure, there are the classic English border plants - towering foxgloves, old world roses, primroses and clipped box hedges, but there are also plant-lover plants: gentians, alpines, rare Japanese woodlanders and interesting trees and shrubs. 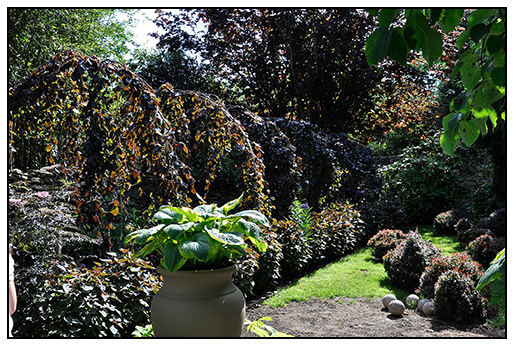 This is truly a knowledgeable plant enthusiasts garden which happens to be charming and designed to perfection. We met Gioia three years ago when she attended a planning meeting for the American Primrose Society at our house. She helped me make a huge baked Alaska that day with me. 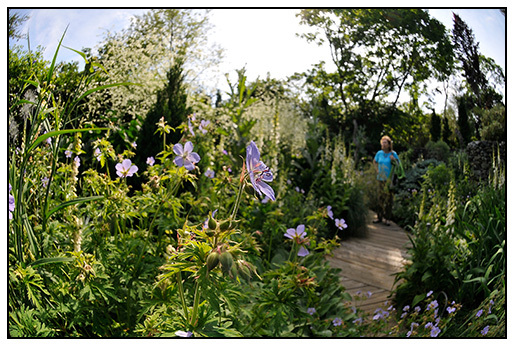 We never imagined that she had help create such an amazing garden, but once we got to know her, it's no surprise. Gioia is a passionate plant collector, so given her knowledge about plant species, this garden makes sense. Gioia is not what one might expect in Little Compton. She is not the 'garden club' type of gardener - she is a get your knees muddy, start your own primula species from Tibet sort of gal. Sure, she can still work her Lilly Pulitzer as fine as her posh neighbors, but what impressed us was her collection of rare plants. Many planted in drifts. Clearly, she knows what she is doing out in the garden. 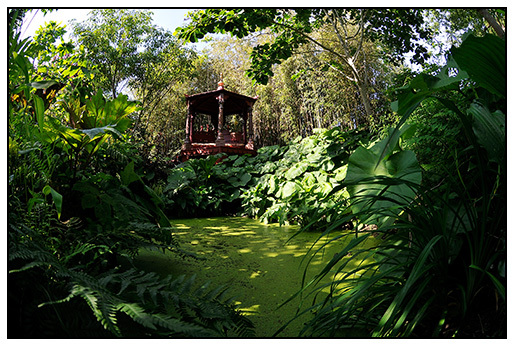 Gioia and her gardener have created one of the finest American gardens, and surely, they are not done yet. 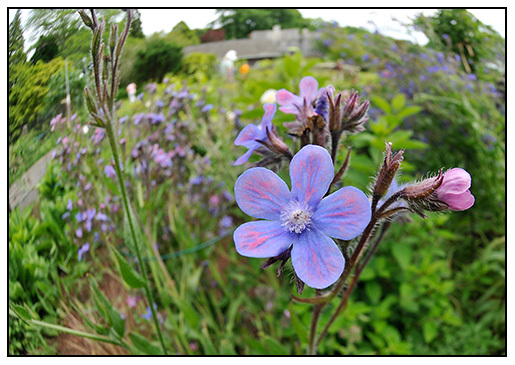 A STUNNING BLUE ANCHUSA AZUREA 'DROPMORE' IN BLOOM IN THE CUTTING GARDEN. ON THE LEFT, A PRACTICAL COMPOST PILE WITH ENGLISH SWEET PEAS ALMOST IN BLOOM. 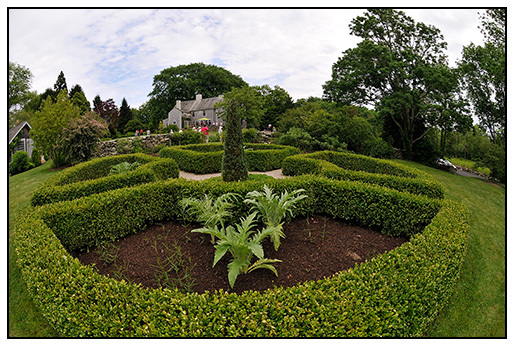 Herbaceous single white Peonies and clipped box and holly hedges demonstrate great a thoughtfullness ( not restraint) in a part of the world where blue hydrangreas and pink roses are amnipresent, if not iconic. 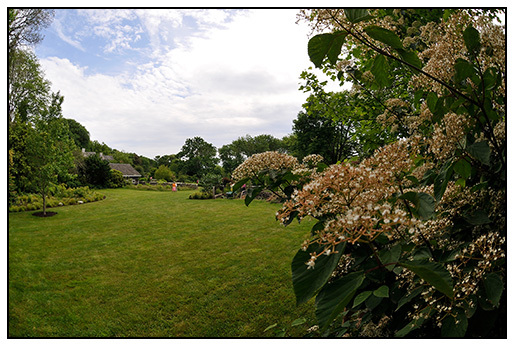 I was first introduced to the private garden known as Sakonnet Garden in pages Ken Druse's book The Collector's Garden (Clarkson Potter, 1996). I remembered every photo - the Crytomeria lined walk, the room of pink Rhododendrons, the little red chairs, the boxwood hedges and the wood paved walks. This weekend I finally visited this very secret garden, hidden behind a tall stone wall in posh yet rural Little Compton, Rhode Island. The garden was open for the past two weekends only, as part of the Garden Conservancy Garden Open Days, and I was delighted to be invited to attend. A PAIR OF SUCCULENT DOMES TOP OFF TWO STONE WALLS AT THE MAIN GATE. THESE ARE BUILT FROM MOSS-LINED WIRE BASKETS TURNED UPSIDE DOWN, MAKING THE ENTIRE OBJECT EFFECTIVELY GEOMETRIC YET IMPRESSIVELY MYSTERIOUS. 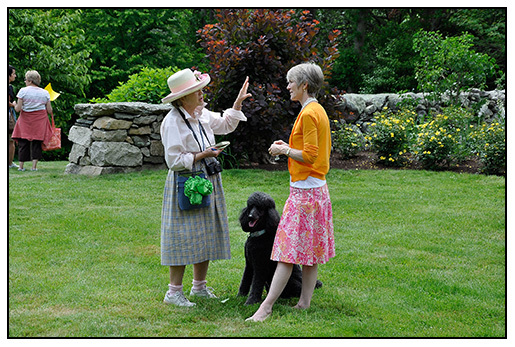 This year there were two gardens in Rhode Island participating in the Garden Conservancy Open Garden Days, check the Garden Conservancy schedule here, to find out about Open Days near you. 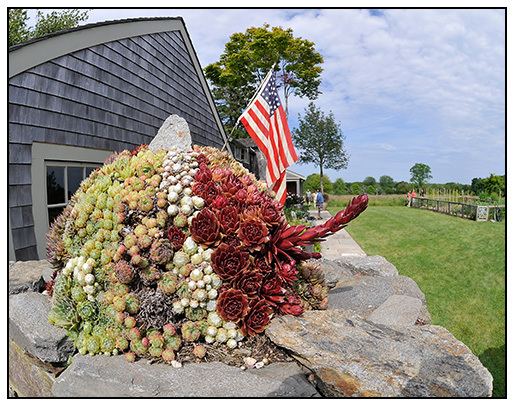 Sakonnet Garden is the creation of John Gwynne and Mikel Folcarelli, two energetic and obsessed plant collectors who have taken their passion far beyond the idea of a mere garden, they've created something special - a living museum. Hidden from the road completely, the only hint is the number of the address on a tree. A short driveway lead to a gravel car park, a garage and a massive stone wall. I started to wonder where the garden was... a dare-I-say quaint 1910 shingle home, typical for this area of Rhode Island was thoughtfully restored and updated with a massively thick granite stone walk, a magnificent stone wall that was taller than I was hid the lawn and meadow behind it. Around the home, a few potted plants arranged tastefully showed the restraint of a designers mind, a clothes line complete with willow basket set out reminded me of beach homes when I was a kid ( this originally was John's parents summer home), and a sweet grassy and fenced terrace remained much the way his mother had gardened there, complete with a few peonies, a chaise and a simple fence. When I saw this, I looked for my mother, for every evening this was a ritual in our garden. 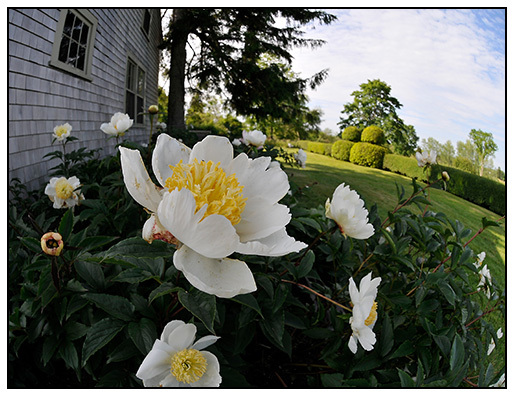 At Sakonnet Garden, nothing was too perfect, rather, it demonstrated countless ways one could be perfectly imperfect. Life is that way, nature follows the same rule of perfect imperfection too. John and Mikel neither celebrated not hid parts of a garden where they live, instead, everything is there for a reason. A compost pile can be beautiful in the middle of a lawn, if it abuts a vegetable garden, A bucket of dumped refuse from a breakfast from the past sits upon clippings from a lawn, artichoke leaves from a plate, and weeds. It;s not only OK, it's just life. (or at least it should be). Mikel was kind enought to take some time to give us a personal tour, but so far, I started to wonder about where this amazing garden that I had read about actually was. So far, the entire space was thoughtful. Simple, clean, uncluttered. Mowed lawn, a boxwood hedge, and then meadow. But oh, what a meadow. We saw the wild Iris long before we arrived, as a mile or two before we reached Sakonnet Garden, we stopped to photograph a nearby meadow full of Iris versicolor, at least I believed that it was the common Blueflag Iris, Iris versicolor, later, I learned that the Iris is a rarer species, that of Iris prismatica, known as the Slender Blueflag or the Cube Iris. A species that is similar to the larger blueflag, but is distinguished by the width of the leaves, which are only a 1/4 inch wide, similar to the grasses it grows with. We rounded back to the parking area near the garage, and Mikel then said "so, are you ready to see the garden?" He lead us down a mowed strip in the meadow along side of the property, to a steel gate that was taller than all of us. Beyond this portal, lay a labyrinth of garden rooms - I heard voices in nearby rooms saying things like "Can you beleive this? It's is like a Disneyland for plant lovers". As a designer who worked on some Disney Theme park activations myself, I had to admit, that many of the principles of theme park design have been employed here - for example, "the big weenie - which is what Disney Imagineering insists in added to every project, from a theme park ride to a restaurant - it means, add one thing that is so awesome that everyone will look at it and go "ahhhhh". At Disney, it would be a giant castle, or a huge globe that lights up at night at EPCOT. A giant sculted tree of life smack in the middle of Disney's Animal Kingdom. At Skonnet Gardens? 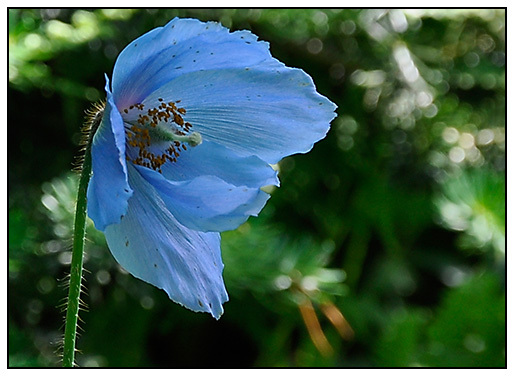 I might be a rare blue Meconopsis, or a an exotic temple rising above a pool of huge, floppy Petasites leaves, it might simply be a color theme, a long vista giving one a view through four rooms, a returning path through the same garden, but at a different level. 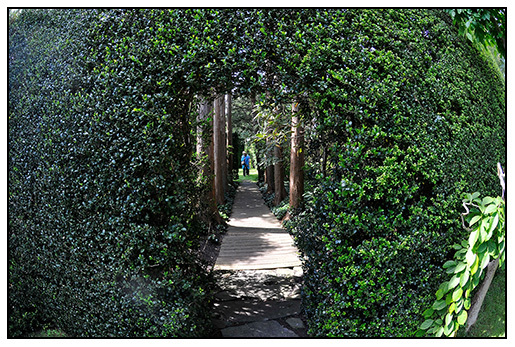 A gate of Ilex crenata becomes a green portal, a virtual star gate to another land. Beyond? The allee of Cryptomeria japonica. In different ways, I connected to both John and Mikel, John, a talented artist and designer who had pivotal roles in designing the Bronx Zoo, and Mikel, a Creative Officer at the fashion brand Façionnable based in Nice - we all have crafted a life where we play and plant, become part of nature, and then change and augment nature daily. We design with nature, allow nature to become art, or to simply be 'art' - we create scenarios where nature can carry on peacefully, with some stewardship, and we even sometimes aid nature in a world where it often seems that the opposite is happening. Gardens are so much more than just places where one plants plants. The are environments where all of the senses can be tweaked. 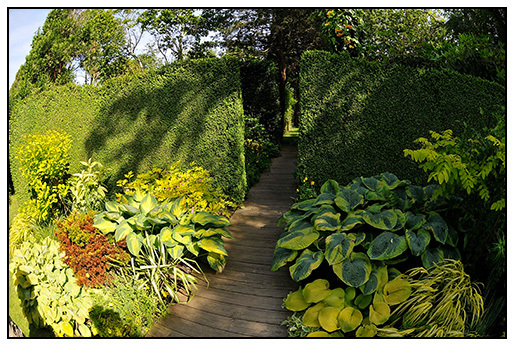 Scent and sight are two obvious ones, but there is an emotional aspect to a garden too, or at least in some well crafted gardens. A garden can give you goosebumps, it can make you feel cosy, nervous with anticipation, excited, it can surprise you, especially when you turn a corner or step into a room and go 'Wow, look at that", Like a well hung museum show, a garden can provide restful places for the eye, too. 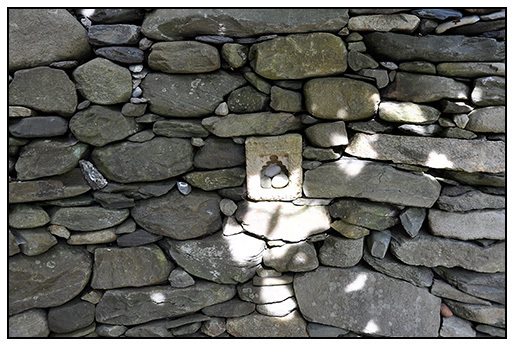 A cool stone corner, with a single stream of water, a long narrow wall between rooms, lined in bow wood that towers over you. Each garden room here has a different theme, each one surprises you, make you smile, then feel serious, gaze in awe or inspire you to site for a white in it' peaceful, quiet space. This is a garden that I would cherish some time alone in, and not with a crown of people. In that way, it is very much like a museum. "I want to sit on a bench in that room with the massive Sol Le Witt and just absorb it". Birds were our friends, here. -not sparrows as in my home garden, but a warbling Carolina Wren,and the wood oboe tones of a Red-Breasted Grosbeak high in a Pawlownia tree, a distant wood thrush and Oven Bird, even a Crested Fly Catcher. One is surrounded by summer life. It made me melancholy and even a little sad, since these are the things that I miss in the home I grew up in - in my garden, we returned to the "thump thump thump' of techno music in the low riders, as a pit bull barked and English sparrows chirped making the yard that just two years ago would have been rich with the dawn chorus. Firetrucks screeched by at midnight, and then a few bomb blasts from home made fireworks at 2:00AM. Clearly, it's time to think about leaving my garden and move on to a better land, but until then, I need to visit and dream, - a practice many of us can do, since, yes, there are always ways to improves ones garden, and visiting other gardens can inspire one to make life changes that are often too difficult to make alone. Wondering how a garden can change your life? Look at these pictures, and let me know what you think. Sometimes, experiences like this can change your life. 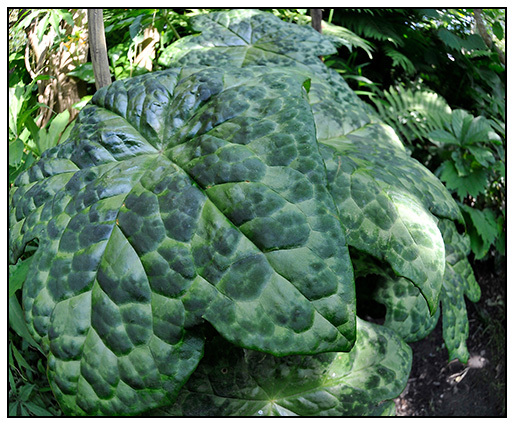 A SITTING AREA IN VERMILION, IT APPEARS TO BRILLIANTLY FLOAT ABOVE A SEA OF PETASITES JAPONICA SSP. 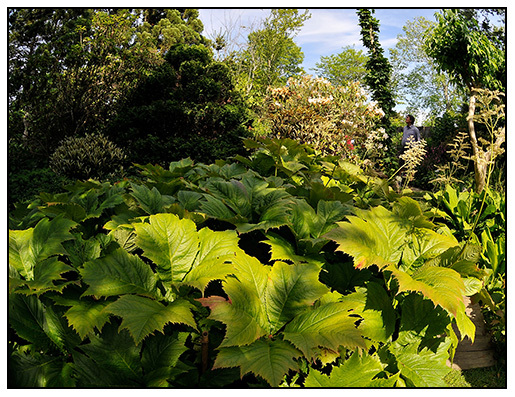 GIGANTEUM ( AND, A GUNNERA). BY NOW, ONE FORGETS ONE IS IN RHODE ISLAND, LAND OF THE BLUE HYDRANGEA AND WHITE PICKET FENCE. Living and gardening incorporating simplicity isn't easy, especially for plant collectors, but John and Mikel found a way to do it. I'm sure there are arguments and bouts of eye-rolling between he two of them ( as Joe and I do) about where a plant should be planted, or about a garden space that one may feel needs refreshing, but in the end, it all must be resolved. Do I dare call it 'purposful restraint'? Maybe, but as a designer myself who works on large, global projects, few things happen alone, there are teams to execute, and even more who can make reality happen. Often, this is the phase when a project can drift off from a singular vision. One gardener, or rarely two, will eventually need to dominate, to stand their ground. I never had time to ask wither John or Mikel ( nor Ed Bowen!) where the struggle ends, or starts, for a garden this complex is very much like a business - and new product lines are on a continual cycle of evaluation, elimination and germination. There is a a process - a concept, visualization, and then, reality. Such things rarely happen without fire. 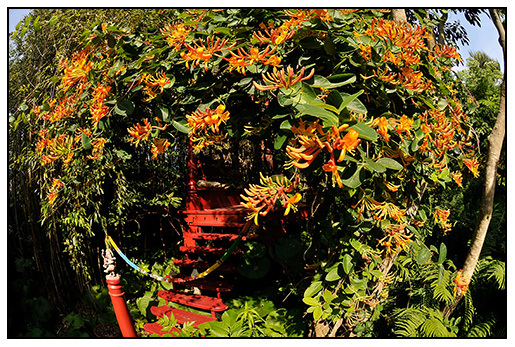 CINNABAR STAIRS AND THAI GARLAND- John and Mikel love tropical fusion, here Honeysuckle on a June day in Rhode Island. This garden transports the guest, to a different country in every room. And now, to England. If this is not on your wish list, it is now - Podophyllum delavyi. There are just some plants that you pass over in catalogs, until you see one in person. Lift a leaf, and these are the flowers. 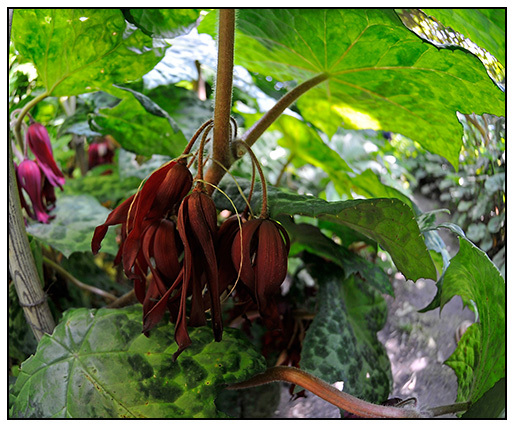 THE FLOWERS OF PODOPHYLLUM DELAVYI ARE A SURPRISE TO ANYONE WHO SNEAKS A PEEK UNDERNEATH THE MOTTLED UMBRELLA SHAPED LEAF - A SHREDDED RED TASSLE AWAITS. Some rooms became very flower-show like, yet when staged outdoors, became magical and sureal with the broad open sky, the buzzing of bees, and dragon flies. This garden room, suddenly transformed our journey into a very English one. 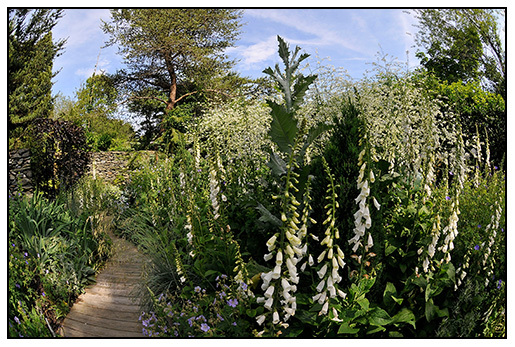 Skyrocketing foxgloves, and giant clouds of Crambe cordifolia, tower over head, not just because they are tall, but because they are planted on a berm, a trick that used mounded soil to raise the plants to magnificent heights. It creates a canvas that is more vertical, lifting and exposing plants to the eye with a new dimension. 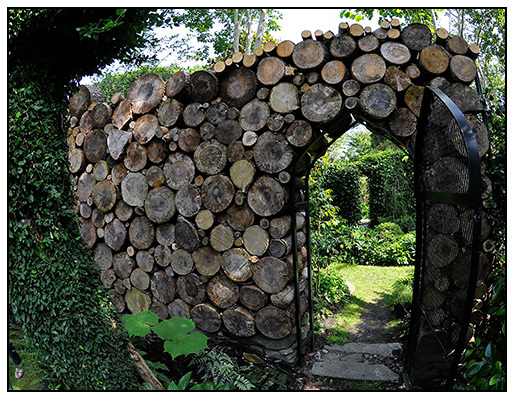 A practice I want to steal for our garden, as it is flat too. MIKEL CALLED THIS RED FOLIAGE GARDEN, A HOMAGE TO THE RHODE ISLAND RED, A WORK IN PROGRESS THAT HAS SOME SHRUBS TRIMMED TO LOOK LIKE THE FAMOUS RHODE ISLAND CHICKEN. RODGERSIA PINNATA, MY FAVORITE PLANT, GROWN THE WAY IT SHOULD BE, AS A CARPET. THIS HIMALAYAN BEAUTY WAS SPOTTED NEAR A POOL. 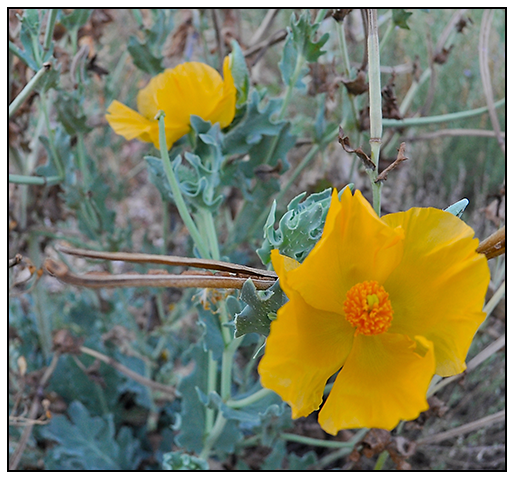 THE RARE TIBETAN BLUE POPPY, MECONOPSIS BETONICIFOLIA. THE YELLOW GARDEN, LEADS TO OTHER ROOMS BEYOND, EACH WITH DIFFERENT COLOR THEME. And then, of course, there is the plant material. Arisaema of most every species, rare trees, rare shrubs, rare, rare, rare everyrare one looked. A tall forest of rhododendron trunks, a canopy of red beech trees, a garden composed completely with a palette of yellow tinted foliage. A RARE MEADOW IN NEW ENGLAND, NESTING BOBOLINKS WERE SIGHTED! We returned from our "theme park" ride back to the meadow. John's other passion is the preservation and stewardship of the few remaining grasslands in this part of coastal Rhode Island. These grasslands are essential breeding habitats for many migratory song birds, most notably the Bobolink, which breeds only in open grassy meadows and grasslands in the north eastern US and Canada. 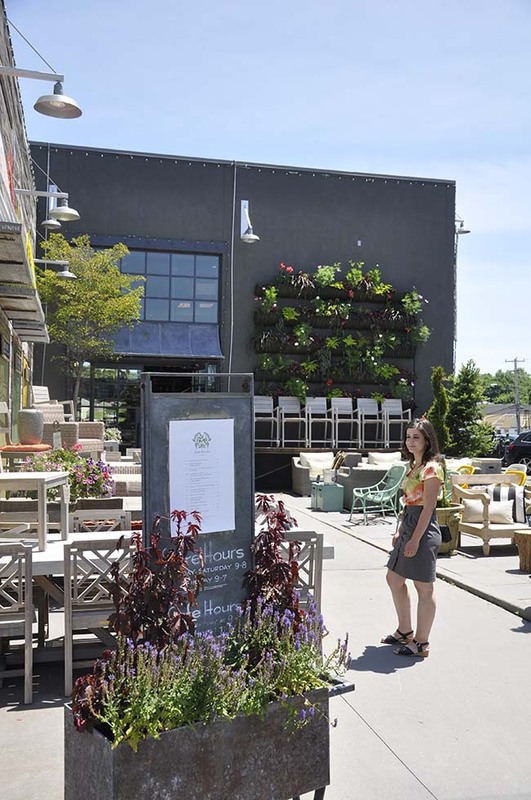 These natural habitats of swaying timothy, Milkweed and blue stem are becoming scarcer each year across North America as farm land becomes inhabited with McMansions and outdoor shopping malls. Ground nesting species such as the Bobolink and Meadow Lark require special attention since they need quiet open spaces to raise their young.Stewardship means more than just "saving the land", it means maintaining it the right way - such as haying later in the season - after August 15th, so that broods are allowed to mature without being disturbed. Early haying in July will destroy nests, along with young and food sources). 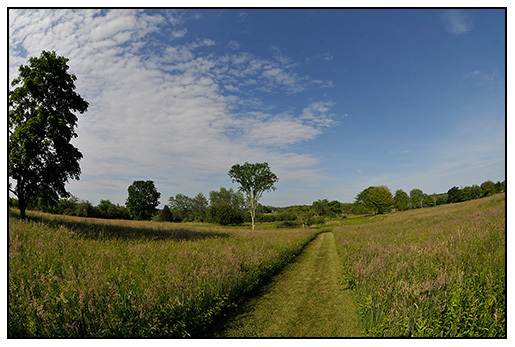 John Gwynne and Mikel are dedicated to preserving the grasslands of coastal Rhode Island and New England. 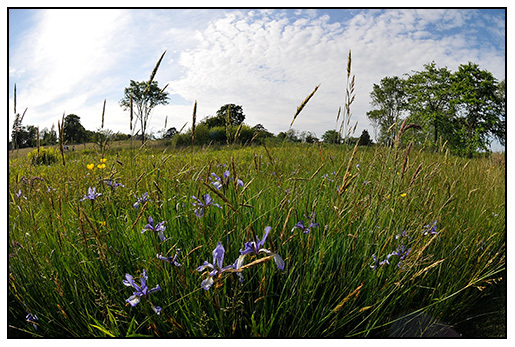 To learn more about their project WILDMEADOWS, visit their site here. 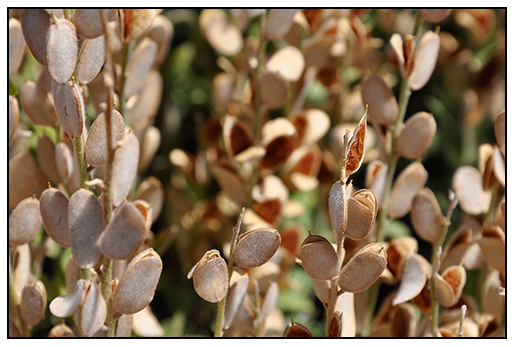 Later this week, photos from the other garden we visited. 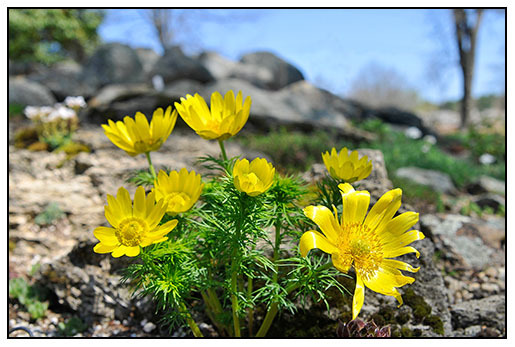 Adonis vernalis in bloom in a tufa bed in the rock garden of Peter George, a collector of rare alpine plants who gardens in the quaint New England village of Petersham. ( I know, I usually show my Adonis vernalis, since Peter and I bought out plants together, but mine disappeared this year). 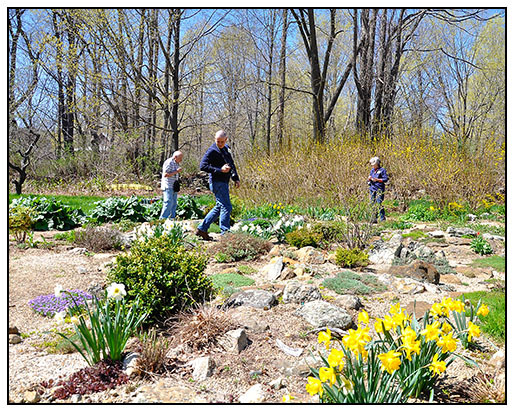 Members of the New England Primula Society tour the Petersham, MA garden of Peter George, an esteemed member of the North American Rock Garden Society. It was a perfect spring day here in New England, with a brilliant blue sky, and warm temperatures. Oriole's, tweeting migrating Warbler's, chirping Robins and Wrens sang while clouds of black flies swarmed around us. 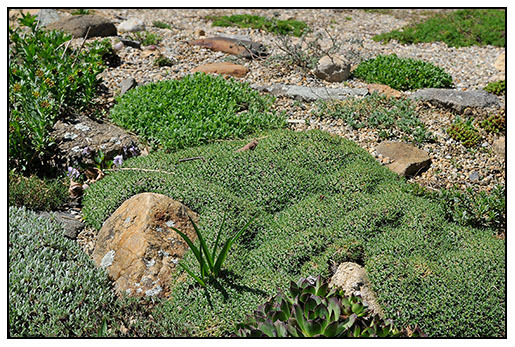 Saxifrages come in many sizes and forms, and I knew that Peter George had many, after all, we fought over many plants at the Oregon NARGS meeting two years ago. I would venture to say that Peter has ten times as many Saxifrages as I do. 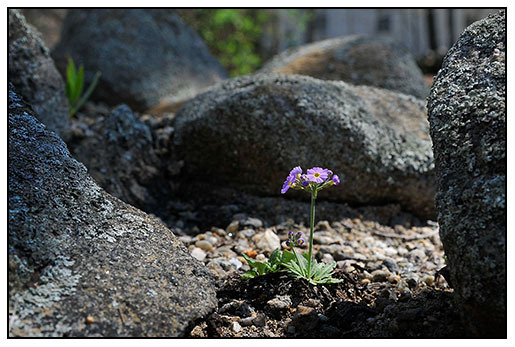 A birds eye Primrose, or a farinose primula sits in a sunbeam safe between giant rocks. 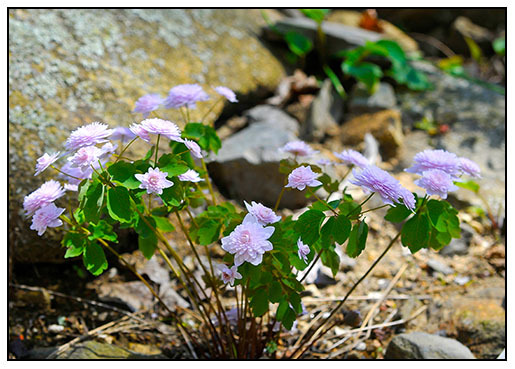 Anemonella thalictroides 'Schoaf's Double', a precious woodland Anemone that lasts only a few days in a New England spring garden making it one of our most lovely spring ephemerals. 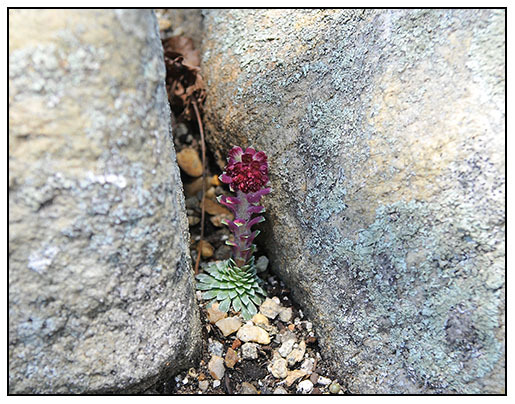 A lone Saxifrage nestled safely between boulders. 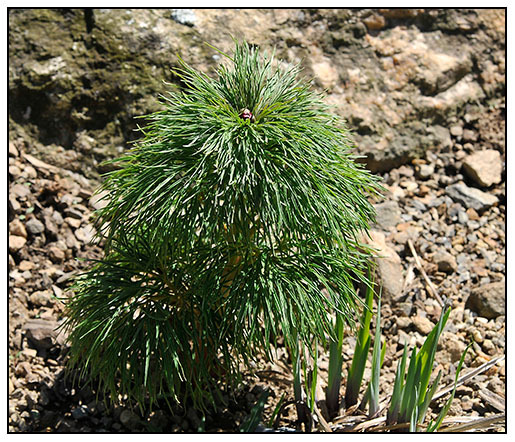 A pine? Nope. This is a peony. Paeonia tenuifolia, a highly treasured rock garden peony that makes a stunning specimen plant once established. 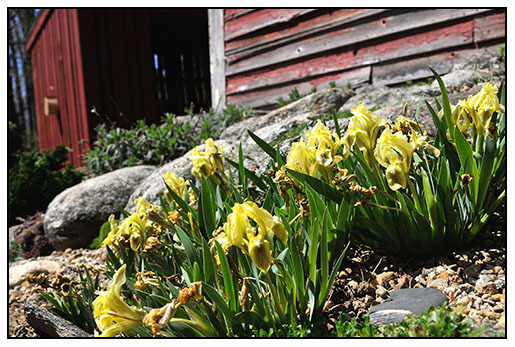 This yellow dwarf Iris is no taller than 8 inches, it blooms in front of Peters Barn which was built in the 1800's. One of Peter's passions is Eriogonum, or the flowering Buckwheats. 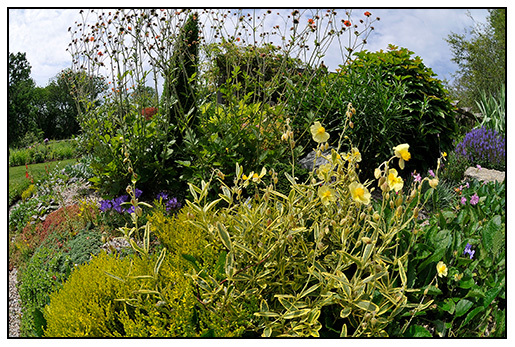 I have yet to try them, but after seeing his collection of the alpine plants, I now think that I might try some. Perfect for a dry location in full sun.